upper right verso in graphite: "# 10"
Georgia O'Keeffe: The Poetry of Things, The Phillips Collection, Washington, 1999, as Special No. 2. 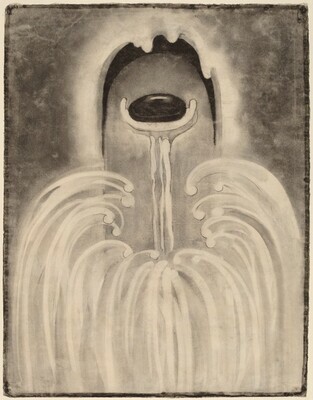 O'Keeffe on Paper, National Gallery of Art, Washington, D.C., 9 April-9 July 2000, no. 1. Cowart, Jack, Juan Hamilton, and Sarah Greenough. Georgia O'Keeffe: Art and Letters. Exh. cat. National Gallery of Art, Washington, DC; Art Institute of Chicago; Dallas Museum of Art; Metropolitan Museum of Art, New York, 1987-1989. Washington, 1987: no. 1. Haskell, Barbara. The American Century: Art and Culture, 1900–1950. Exh. cat. Whitney Museum of American Art, New York, 1999: 100-102, no. 184. Lynes, Barbara Buhler. Georgia O'Keeffe: Catalogue Raisonné. 2 vols. New Haven and London, 1999: no. 45. Fine, Ruth et al. O'Keeffe on Paper. Exh. cat. National Gallery of Art, Washington, DC; Georgia O'Keeffe Museum, Santa Fe, 2000: no. 1. Greenough, Sarah ed. Modern Art and America: Alfred Stieglitz and His New York Galleries. Exh. cat. National Gallery of Art, Washington, DC, 2001: fig. 86.